Come show your opposition to the expansion of the Phillips 66 Rodeo refinery! The Bay Area Air Quality Management District (BAAQMD) is considering Phillips 66’s application for a permit to more than double the number of tankers coming into their marine terminal. Since Phillips 66 owns a big tar-sands mining operation in Alberta, we can assume the tankers will be bringing tar sands oil. First Nations in Canada have been battling the planned tripling of the pipeline that brings tar sands oil from Alberta through their lands to the West Coast, where it can be shipped to refineries in California. Phillips 66 has denied that expanding the wharf will mean increasing production at the refinery. However, bringing in the additional amount of oil enabled by the wharf expansion plus the amount currently carried by the pipeline from the P66 sister refinery in Santa Maria equals a 15% increase in capacity. Expanding production would mean emitting more greenhouse gases and health-harming pollution into neighboring communities. In addition, increasing the amount of oil coming through the Bay in tankers will increase the risk of oil spills, like the one at Phillips 66 last September, which sent a plume of toxic air to Vallejo. But it’s worse — because tar sands crude oil is so heavy and thick it can’t be cleaned up once it’s spilled. It would just sink to the bottom of the Bay and stay there, contaminating the water, plants, and wildlife. Now BAAQMD has created an “ad hoc committee” on refineries, which plans to discuss these issues at its next meeting. 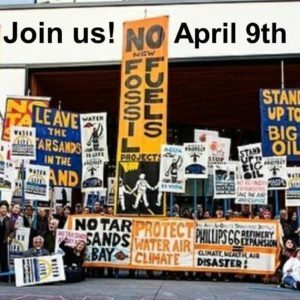 Come tell BAAQMD: No tar sands in the Bay! No new fossil fuel projects! No Phillips 66 expansion! And stand with First Nations people in Canada fighting for their land.